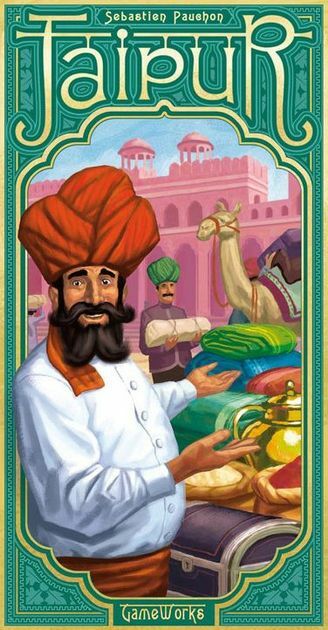 Jaipur was a game that entered my radar very early on in my board gaming journey. However, time-and-time again I’d pass on it. In a classic case of judging a book by its cover, it was a game that didn’t appeal to me due to it being a game about merchants selling goods, which is a theme that failed to pique my interest. Years after the fact, I finally gave the game a chance to see what the hype was all about. In this two-player card game, players take on the roles of rival merchants. You’ll attempt to outperform each other in the marketplace in order to earn enough Seals of Excellence to secure an invite to the Maharaja’s court. This will be determined in a best-of-3 series. The game is played with a deck of cards featuring different kids of goods, such as leather, fabric, spices, silver, gold, and diamonds. There are also camel cards, which can’t be sold, but are essential for distributing your goods. Along the side of the table are chips that correspond to each of these goods, each with point values that decrease as you move further down the stack. There’s also bonus chips that are granted for larger transactions, but more on that later. Each player is given a hand of five cards. 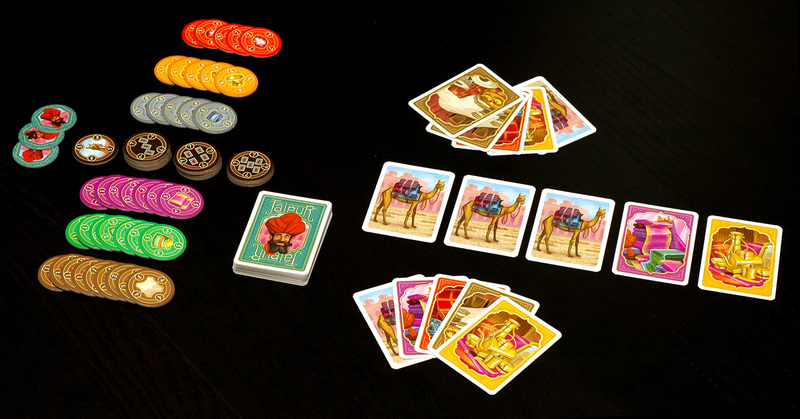 Players will then place any camel cards they have to start face-up in front of them. From there, three camel cards are placed in the centre of the table, along with the top two cards from the draw pile. Now you’re ready to play! On your turn, you can perform one of three possible actions. You can draw one of the five goods cards from the centre of the table, which is then replenished by the draw pile. You can grab multiple goods cards from the spread, but you must replenish them with cards from your own hand. You can take all of the camels currently on the table. Or you can sell sets pf cards from your hand in exchange for chips. The player whose chips total the largest amount wins the round, with the player who is the first to win two wins the game. What makes the game tick is the constantly trying to determine the right time to sell. On one hand, if you sell right away, you get first dibs at the highest valued chips. However, if you’re able to sell three or more cards at once, you’ll earn multiple chips for that transaction, including a bonus chip that can be worth a ton of points. The game moves quickly, and it’s always a thrill trying to find the right moment to cash out. I really wish that I had given Jaipur the time of day sooner. It’s an excellent two-player game that finds a brilliant balance between speed, accessibility, and strategic depth. Whether you’re new to the hobby or a seasoned veteran, this is a quality addition to your library. Previous Article W’s and L’s: Pocket Rumble Online Play!